LISBON (Reuters) - The leader of Portugal's Communist Party accused the country's conservative president on Wednesday of dragging his feet in appointing a new Socialist-led government and said his hesitation risked harming national stability. Political uncertainty has reigned in Portugal since an inconclusive election on Oct. 4, when the austerity-minded center-right government of Pedro Passos Coelho won the most votes but lost its parliamentary majority. The Communists and the Left Bloc have agreed to support a Socialist government, ensuring it a parliamentary majority. But President Anibal Cavaco Silva has embarked on a lengthy process of consultations before deciding whether to ask Socialist leader Antonio Costa to form a government. On Wednesday the president met Portugal's top bankers. "The four leftist parties have an unequivocal majority ... There are no pretexts that can justify the attitude of the president," Communist leader Jeronimo de Sousa said. He said the president had set conditions for the leftist parties that he had never required of the center-right. 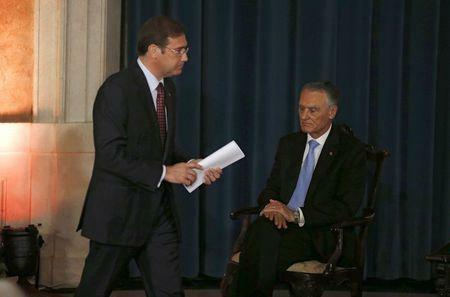 "Any attempt by Cavaco Silva to subvert the constitution will have a democratic response from workers and the people. Cavaco Silva thus assumes responsibility for the political and institutional consequences ... contributing to a worsening of the national situation and promoting confrontation with other sovereign organs." Cavaco Silva has given no indication of when he might make a decision to end the deadlock. He is due to meet economists on Thursday and political leaders on Friday. Portugal's largest union, the CGTP, has called a protest rally in front of the presidential palace for Nov. 28. Portuguese bankers appeared cautiously optimistic that any future Socialist government would stick to the course of budget consolidation despite concerns among some investors that it might prove spendthrift. Socialist leader Costa, who has promised to keep reducing Portugal's budget deficit and public debt, met the bankers, including Millennium bcp chief Nuno Amado and Banco BPI head Fernando Ulrich, earlier this week. "If Antonio Costa is named the next prime minister, I'm confident that he and the Socialist Party will have the required sense of responsibility to keep the country on a rigorous path and will guarantee the stability of the financial system," Ulrich told reporters after meeting the president on Wednesday.